Kawasaki Ninja 250R bike is launched by Bajaj in India and is sure to give a stiff competition to all the bikes coming under this segment. The bike has already captured the attention of bike enthusiasts all over India and the bike will surely make a firm hold in the Indian bike market. 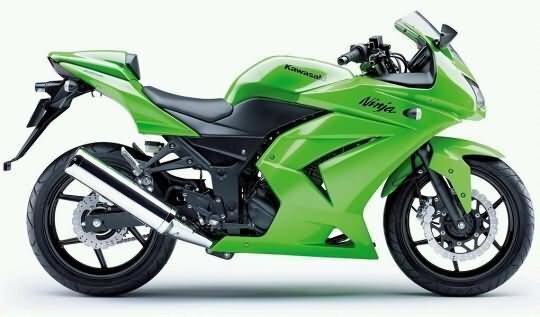 Kawasaki Ninja 250R is available in two colors – Lime Green and Ebony Black. The bike comes with front full plastic fairing while fuel tank is in steel. The dual lamp headlights, large wind screen, front turn indicators, sleek tail lamp impart a sporty look to the bike. The six spoke black alloy wheels give a sturdy appearance to the bike. Kawasaki Ninja 250R has many comfort features. The self start bike has Analogue Fuel Gauge, Analogue Tacho Meter, Analogue-1 Trip Meter, Analogue Speedometer and Passenger Foot rest. Other comfort features include Step-up Seat, Pass Light, Low Fuel Indicator, Low oil Indicator, Low Battery Indicator, High Oil Temperature Indicator and Choke Air Filter Indicator. Kawasaki Ninja 250R has paid special attention for the safety of the rider. The front suspension comprises of 37mm hydraulic telescopic fork while the rear suspension comprises of Uni-trak with aluminum linkage. Braking system is really superb as far as this bike is concerned. The front brake comprises of 290mm Petal hydraulic disc while the rear brake comprises two piston caliper grips with 220mm Petal disc. Kawasaki Ninja 250R is fitted with 249cc, DHOC four stroke power mill, parallel twin, liquid cooled engine. It produces a maximum power of 32 bhp at 11000 rpm and a maximum torque of 22 Nm at 8200 rpm. The bike has 6 speed transmission and a radiator. The combustion chamber has been so designed to optimize combustion efficiency and reduce emissions. 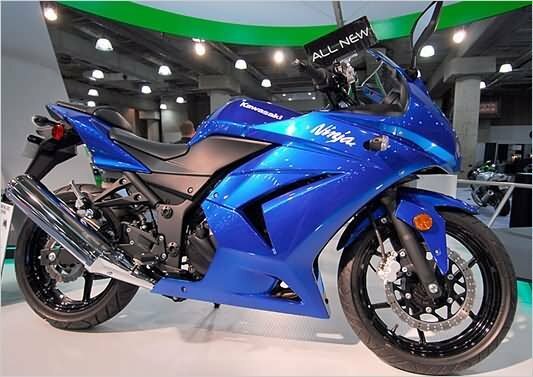 The price of Kawasaki Ninja 250R is Rs.269000 (taking Mumbai as base price location). However, the price specified is indicative price only and reflects lowest approximate price which excludes tax, registration, insurance and cost of accessories.